Identity verification is something that we all have to deal with if we want to participate in the modern, digital world. Nevertheless our data is often poorly protected and vulnerable to attack. We should live in a world in which our identity truly belongs to us and cannot be taken by anyone. That is what we are working towards. Below you will find our past successes and our future milestones. Join us on our voyage into a better future. 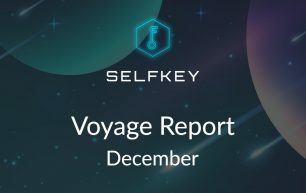 SelfKey has a rich history of achievements, from a successful proof of concept with Standard Chartered Bank to the launch of the SelfKey Wallet in 2018. KYC-Chain donates the code base of SelfKey Wallet to the SelfKey Foundation. 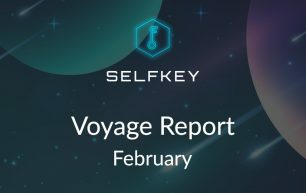 The SelfKey whitepaper is released. SelfKey provides KYC processing for token sales and fintech startups such as Aditus and Airswap. Raises $21.7M USD in just 11 minutes with incredible support from the community. SelfKey Wallet begins early testing with community. Adding identity attributes and documents supported in SelfKey Wallet. Portfolio management of Ethereum assets supported. The Wallet launches and is downloaded thousands of times on the same day. Fully integrated with Ledger and TREZOR hardware wallets. We are proud to announce that the Incorporations Marketplace has launched this month. Inside this marketplace, you can set up a new corporate entity and pay for services with KEY tokens. Thank you for joining us with the second product update of this year. We’ve been hard at work getting the Incorporations marketplace ready for launch, including fixing the remaining bugs, preparing the help documentation, and step-by-step tutorials on how to use this new marketplace. Happy New Year and thanks for joining us in the first monthly update of January 2019. In the past month, we’ve been preparing for internal testing of the Incorporations marketplace. Are you ready to join us on our voyage? Then download the SelfKey Wallet today!